Simple recipes packing a PUNCH of flavor that any home cook can recreate! September 17, 2012 By arzea 8 Comments This post may contain affiliate links. Read my disclosure policy. We love Chinese food over at my house, but we don’t really order it much because I haven’t been able to find a place that doesn’t cook with an excessive amount of oil or msg. 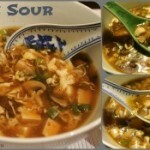 I found a recipe for Hot and Sour Soup over at the JessFuel blog, and with a couple of little changes I gave it a try. It turned out really great, and was easy to make. It makes a HUGE pot of soup, probably around 6 servings or more (big servings). I made it with ginger garlic broccoli and zucchini, and it was delicious. I will post the recipe for that later this week. This is great for the cool weather that has been popping up now that it is fall! Probably the coolest part of this recipe is when you stream the egg whites in…they cook instantly and it’s a really cool effect. My husband thought it was the coolest thing ever! Heat olive oil and 1 tsp sesame oil in a large pot over medium heat. Add red pepper flakes and cook 1 minute. 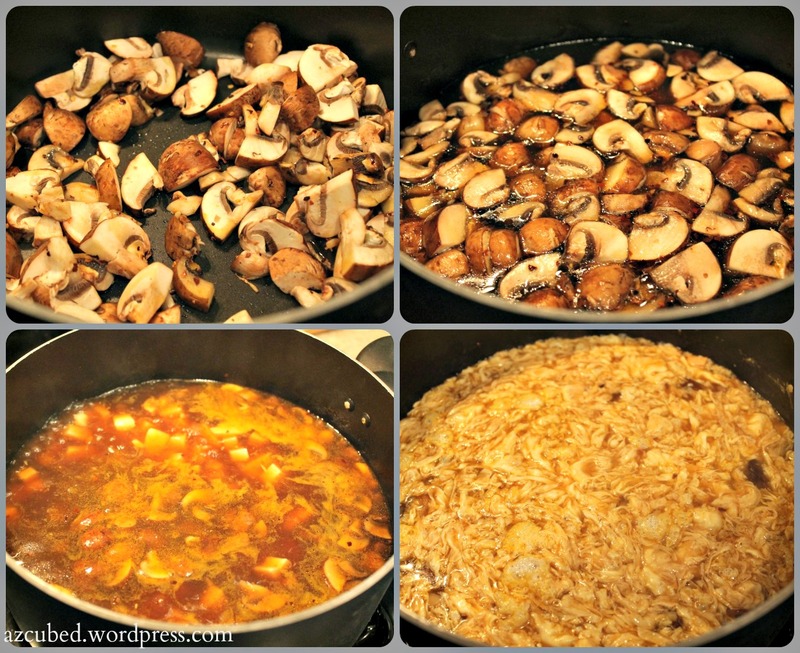 Add mushrooms and saute until soft and browned. Add garlic and ginger and continue sauteing 1-2 minutes, until fragrant. Add vegetable broth and 2 cups water. Bring to a boil, then reduce heat and simmer 5 minutes. Add vinegar, soy sauce, pepper and tofu, and simmer another 3 minutes. In a small bowl, whisk together remaining 1/4 cup water and cornstarch. Add to pot and continue simmering 3 additional minutes, stirring frequently. Season to taste with salt & cayenne (I like it spicy, so I used about 1/4 tsp cayenne). Slowly stream egg whites into the pot while stirring continuously. 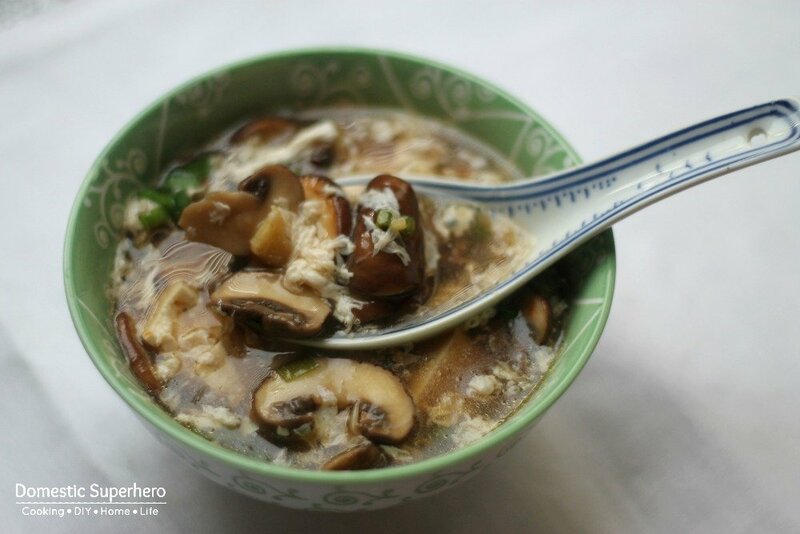 Remove pot from heat and stir in green onions and remaining 1 tsp sesame oil. So glad you enjoyed this recipe! It’s definitely a GREAT one! Especially now that the weather is turning… I may just have to make it again myself sometime soon! Thank YOU for the recipe! I think, I will be trying this one very soon! thanks for sharing! You are welcome! Let me know how you like it! 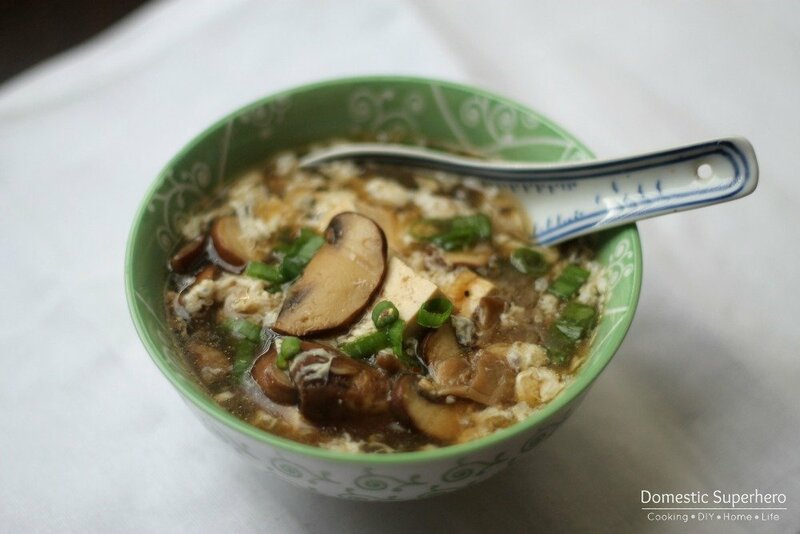 I love hot and sour soup. I need to try this! 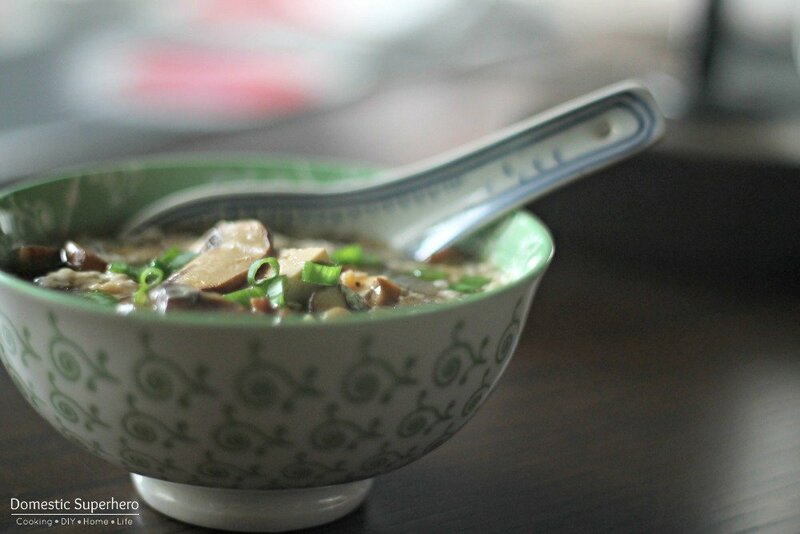 This soup was pretty good, and definitely great now that the weather is getting cooler. Thanks for stopping by! Hi! I’m Allyson - Welcome to my blog where you will find lots of recipes & food goodness, DIY projects, crafts & a little bit of everything. I’m so happy you stopped by because I have a lot to share with you! Lets connect on social media, and be sure to subscribe to my email so you won’t miss a post!